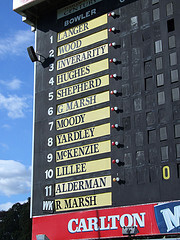 It costs about $30K a season for the WACA to run the manual scoreboard at their cricket ground in Perth. The scoreboard is far from an aesthetic masterpiece but it has some charm and it reminds us of the modern cricket contest: commercialisation vs ritual. Inevitably, the scoreboard will make way for a digital substitute that will swirl advertisements across a facsimile of the traditional display. When it does, they’ll be able to dispense with the six people that work there. But the progress of technology is uneven and it respects the entrenched interests in the hierarchy. Take for instance the prestigious position of ‘Selector’. A national selection panel choses each national team as it has since the bears were batting. Why do we use such a subjective system? That system clearly favours older players over new. We know that overwhelmingly, performance declines as batsmen reach their mid-thirties, but selectors tend to keep people in the team once they’re there. Presumably because of personal attachments and bias. Science tells us that visual acuity declines with age, though some individuals are more affected than others. Reflexes also decline with age. Fortunately, nature has a way of informing us when this happens; cricket statistics. It would be easy to imagine an algorithm that ranks batsmen and bowlers. This could be based on a ten match rolling average but be finessed to include career average and performance on different grounds. (Actually, comparing the current 10 match average and career average yields interesting analytics). The worst performing batsman gets dropped every match (say). And the worst performing bowler gets dropped every match. This system has the great advantage of removing all subjectivity; all favouritism. Forget all that stuff about ‘he’s a champion and a great score is just around the corner’. Institutionalise a regular turnover of personnel so that a team is not suddenly full of 38 year olds who lose form at the same time (looking at YOU, India). You might say subjectivity is necessary to account for teamsmanship and I would say PHOOEY. You might say it’s necessary to allow character to be taken into account and I would say that it’s only a factor in unusual circumstances. Anyway, you might design a mechanism that allows the peer group to influence decisions in that area. Shortly after one team adopts this system, which I would call Solomon, (after the famous West Indian batsman who threw out Ian Meckiff in the Tied Test), the rest would quickly follow. In the case of Australia, you’d dispense with five selectors. They cost more than scoreboard attendants. The slow ritual of the twelfth men carrying the drinks is gone; replaced by dudes on Segways with giant Gatorade inflatable bottles strapped to their backs. It’s as out of place as the cameramen scurrying on to the field like intruding insects. It’s as vulgar as the visual assault of the sponsor’s logo on every vertical surface and the grass the game is played on. Who killed off the stodges of yesteryear and replaced them with commercial administrators bereft of style and spine? And where are those administrators when infestations of drunken nobs ruin the atmosphere for those unfortunates near them? Sitting in the Members’ Pavilion? Had I the power I would have evicted a hundred or so drunks, to the satisfaction of the thousands seated around us. Nice people, Australians, but they should learn how to behave in public. “It would be easy to imagine an algorithm that ranks batsmen and bowlers.” sounds like the movie Moneyball – where the data nerd makes the call on which players get a gig. Send the selectors the DVD. Did we sit next to each other at the WACA? Yes, I saw Moneyball and you’re right; it is exactly that principal. It would be great for the game if they adopted this system; not because it improves team performance but because it removes all that subjectivity that causes such upset amongst players. No-one can complain about selection favouritism or being unjustly dropped – the algorithm will treat every player the same.